“Living the dream.” I laugh every time I hear that phrase. I hear it pretty often now that my husband and I own a vineyard and winery. 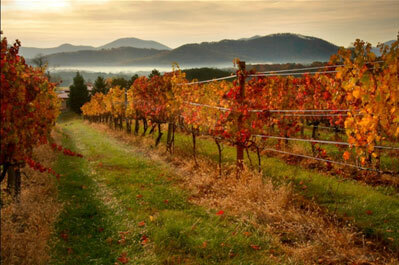 On April 1, 2009, we acquired one of Virginia’s oldest wineries, Afton Mountain Vineyards, located about 25 minutes west of Charlottesville. 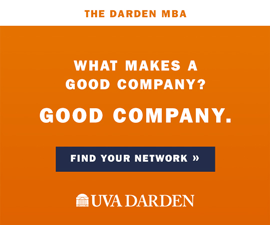 My husband Tony (GSBA ’87) and I both grew up in the Charlottesville area; I went straight on to UVA, Tony went to Davidson College in North Carolina and returned to the area to attend graduate business school. 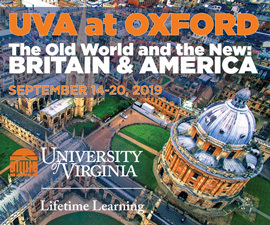 From Charlottesville we moved to Tidewater, Va., where we lived for more than 22 years, working and raising our two kids. We jumped head-first into our new venture, taking on an existing business we had little knowledge of, excepting years of wine consumption. For a while, our lives were insane. In addition to the new business, selling our family home and moving, our son got married, our daughter graduated from UVA, and my in-laws celebrated their 50th anniversary—all over the course of 45 days. Now we are farmers with 15 acres of grapes to manage, working six days a week selling 85 to 90 percent of our wines in our tasting room (everyone else’s weekends are our busiest work days), promoting and selling alcohol and enjoying all the adventures that that entails. Fall is our busiest season—it’s harvest season and we’re constantly covered in grape “schmutz,” lifting 30-pound boxes of grapes, fighting off bees and stink bugs, and hand-sorting the grapes before they go into the winery. Then we wash our sticky hands, stomp off our boots and head in to the tasting room to pour wine. Winter winds howl in Afton. Our first winter here, we had 40 inches of snow in one storm; I plowed for five days to get to the end of our driveway only to find that the main road still hadn’t been cleared. That’s why I laugh every time someone says we’re “living the dream.” They picture us as vineyard owners, walking around our beautiful property with a glass of wine in hand. And you know what? Sometimes we get to do that and it’s pretty darn awesome. We are living our dream. 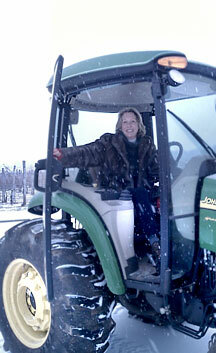 Elizabeth Smith and her husband own and operate the Afton Mountain Vineyards.